Powder Coating Market size is estimated to exceed USD 16.5 billion by 2024; according to a new research report by Global Market Insights, Inc.
Strong business outlook with versatile applications including architectural, agricultural/construction equipment, decorative, A&T components, and outdoor furniture are among the key factors propelling the powder coating market share. Shifting consumer focus towards the adoption of new green building construction techniques along with surging preferences toward eco-friendly building materials will promulgate overall industry scenario in the projected timeframe. The incorporation of new & sustainable solutions and rapid technological advancements to meet the efficiency, durability, and environmental requirements will fuel the powder coating market expansion. Besides, consumer preferences toward powder variants due to the major properties including durability, corrosion resistance, and high luster & shine will further augment product portfolio. Favorable government policies & regulations pertaining to the reduced usage of materials containing toxic chemicals & high VOCs content will boost the powder coating market growth. For instance, in U.S., as per the industrial surface coating regulation update, Hazardous Air Pollutant (HAP) and Volatile Organic Compound (VOC) content of these materials are respectively supervised at the local, state, and federal levels, thereby maintaining safe level of VOCs and HAP in the environment. However, the procurement of thin films may pose a major threat to product growth trends. Thin finishes are difficult to achieve through thin film coatings owing to the formation of uneven texture by the thickening of polymers, hampering the overall industry expansion. Thermoset resin is anticipated to surpass USD 15 billion over the forecast period. Rising product demand in the electronics industry due to its major properties such as dielectric properties, high-temperature resistance, lightness, and non-toxic nature will augment segment growth. In addition, key usages including coating of metal surfaces to form an attractive and durable finish in automotive components, household appliances, and outdoor furniture will further propel the overall powder coating market size. Automotive & transportation components will witness CAGR over 8% in terms of revenue by 2024. An upsurge in the vehicle production coupled with stringent regulations pertaining to high carbon footprint is fueling the demand of powder coatings over automotive wheels and other components, thereby resulting in the significant business expansion. Further, increasing vehicle demand owing to rising disposable incomes and technological advancements in the automotive industry will fuel the powder coating market share. For instance, as per the OICA, the number of vehicles production has increased from 95.05 million in 2016 to 97.30 million in 2017. Metallic substrate leads the powder coatings market accounting for over 95% of the powder coating industry share in 2017. These can be used in a wide variety of applications such as automotive components, agricultural & construction equipment, outdoor furniture, HVAC, and electrical. Key features including high thermal resistance to along with the advantage of ease in coating application as compared to other non-metallic surfaces will proliferate the business expansion. Asia Pacific accounted for over 40% of the overall powder coating market share in 2017. Key factors such as stable economy, rising consumer expenditure level, and rapid infrastructural development in developing countries including India, China, and Indonesia will influence the industry share. Favorable government policies & regulations promoting efficient usage of eco-friendly coatings will support product penetration across the region. In addition, availability of low-cost raw materials will further drive the business share across Asia Pacific. 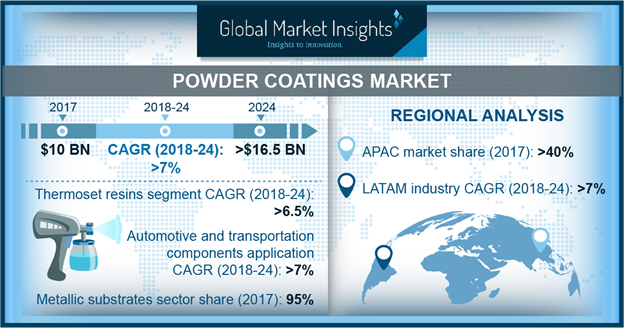 Latin America powder coatings market will observe CAGR over 7% in terms of revenue over projected time period. The automotive and transportation domain is experiencing several transformative shifts that are majorly driven by the economic and technological disruptions thereby influencing the business size. Besides, strong business outlook owing to rapid digital transformation, incorporation of industry 4.0 model, and numerous disruptive mobility services will further elevate overall market share across the region. The global powder coating market share is highly competitive with large presence of multinational companies and regional players. AkzoNobel NV, Axalta coating systems LLC, PPG Industries, Inc., and Jotun Powder Coating are among major the manufacturers present in the business. The manufacturers are constantly focusing in the production capacity expansions and mergers & acquisitions to enhance the overall cash deployment plans. For instance, in February 2017, Axalta Coating Systems acquired Century Industrial Coatings, a manufacturer of high-performance industrial coatings for oil & gas, structural steel, and rail cars. This initiative is aimed at enhancing Axalta’s existing sustainable and durable product portfolio.